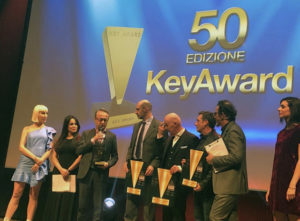 On the occasion of the Media Key Award 2018, the radio communication campaign promoted by the Italian WEEE Coordination Center (Centro di Coordinamento RAEE) won the award in the “Media, educational, leisure and telecommunications” section. The aim of the campaign is to make the public aware of the correct WEEE disposal and is part of the activity plan established for the program agreement between EEE producers, associations of waste collection companies and ANCI. Actuated during two periods (June/July 2018 and September/October 2018), the initiative was realized thanks to the involvement of some famous DJs from the main national radio stations. The DJs were asked to spread a message about WEEE, aimed at knowing this particular type of waste and promoting good practices of collection and management of the end-of-life products, generating the awareness that the correct disposal of technological devices safeguards the environment and creates economic value. “Talking about waste and good disposal practices – comments Fabrizio Longoni, Director General of the WEEE Coordination Center – is easy for the experts in the sector; the difficulty lies in being heard and trying to stimulate virtuous and responsible behaviors in the citizens and consumers. For this reason we opted for the radio as a channel of communication, considering it more immediate for our goal”.